Unlike other objects made of leather, like furniture, coats, purses and so on, the majority of shoe leather is stretched over a last (a wooden or plastic form in the general shape of a foot) to create the shoe upper. To do this the leather has to be within a certain range of thickness. And, certain types of leather define the type and quality of the shoe. Lets dig into what leathers are ideal for shoes. Those are the most common types of animal leather used in shoes. Reptile skins tend to last longer and need less care than animal leathers, but they are also more expensive. Where is Leather Used in Shoes? 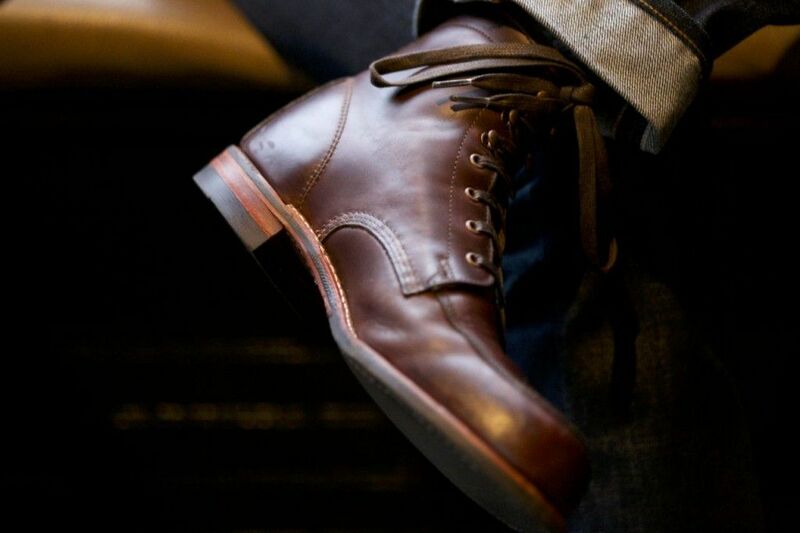 A leather outsole on a man’s shoe is around 12oz in thickness on average. A leather insole is typically around 14oz in thickness to accommodate the welt. A shoe upper is around 5oz on a typical dress/business shoe, The lining is about 1oz. All of these thicknesses can vary due to leather type, welt method, and shoe style. For example Italian shoes tend to be sleeker and therefore use thinner leather in the soles and uppers to achieve the look. Soles that are Blake stitched or bond welted don’t require as thick an insole as Goodyear welted shoes. The quality of the leather used in a given line of shoes is determined by the grade of leather the shoe manufacturer purchased to make the shoes. The leather on a shoe upper is typically grain side out leather, but shell cordovan has no grain, waxed leather is used inside out (flesh side out), and suede leather has had the grain removed entirely. Leather that has blemishes in the grain are often buffed (sanded) of the grain side to remove the blemishes, which then requires the grain to be corrected. Corrected grain leather is sometimes referred to as bookbinder leather. If the grain has not been corrected it is referred to as full grain. One of the final stages of tanning leather is applying the color and finish (although chromium tanned leather can be bought in the “wet blue” state” it comes out of the tanning process in). The high quality leather is typically aniline dyed, which saturates the color completely through the leather. The leather won’t have a coated feel to it. The leather is also pressed under high pressure to give it some shine, and a very thin coat of clear or colored acrylic is applied as a final finish, in most cases. Some shoe manufacturers may also add an additional clear or colored finish coat. In the case of corrected grain, the pressing and acrylic finish is also where the corrected grain is applied. Because of this, corrected grain leather will have a thicker finish than non-corrected grain, and may also be a little shinier. Corrected grain finishes can range from a simple smooth surface to faux animal skin and pebble grain. Corrected grain leather is typically lower grade leather, simply because the grain and aniline dye would be covered up if done to a higher quality leather. And, the thicker the finish the poorer the leather quality can be. There are exceptions to this rule of course; for example: some pebble grain shoes/boots can be made of good quality leather, but it is hard to tell because of what the finish covers up. The best way to tell if a shoe is made of corrected grain leather (actually, leather that has a corrected finish on the grain) is to flex the shoe. The finer the creases the more finish on the shoe (the greater the correction). Shoes come in all types and qualities of leather, so it helps to have an idea of what you are really buying. Another of the biggest indicators you can use for determining if a shoe uses corrected grain is price. Quality costs good money. Yet another way is to look at the shininess since corrected grain leather has a much thicker layer of acrylic. Hopefully this article will give you some things to consider when you are you are looking to buy a shoe. This is a guest post from Glen Tippets, the owner of the shoe care company, GlenKaren Care Products. You can learn more about his naturally made products at glenkarencare.com. 9 Comments on "All About The Types Of Leather Use In Shoes – Type, Thickness, And Grains"